Tremendous opportunity to build your dream home or vacation home on the lake while still in Oak County, Michigan. 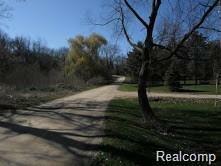 Although this great property is over 3 acres ~ Approximately Half of the Acreage is below the Lake Surface or Inaccessible. Nevertheless a Beautiful Wooded, Walk Out Home Site is Picturesque and Private and there is an Open Area Closer to the Road for Non Wooded Activity Area. Believed to be over 100? of Frontage on Quiet and Peaceful Baker Lake. No Survey or Perk Test Information Available. Aerial with Plat Overlay in Realcomp. Estate Sale Cash or Vacant Land Financing Offers Only Please.